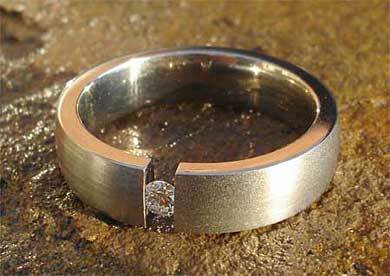 Tension Set Diamond Titanium Engagement Ring : LOVE2HAVE in the UK! 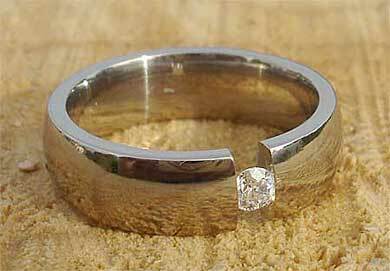 A tension set diamond titanium engagement ring. 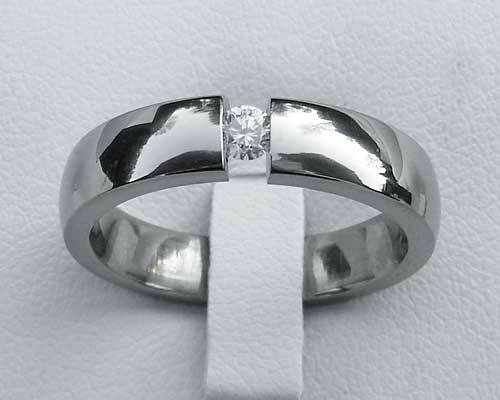 This titanium engagement ring is a lovely cost-effective tension set titanium ring with an 8pt white diamond that is available in both a polished or a satin finish. It has a slightly domed profile, and you have a choice of either a 4mm or a 5mm width. This stone is a nice size white diamond at a superb price, and while there is no doubt that cost plays a big part for most people when choosing a diamond engagement ring, there is no doubt that the silver coloured metals such as titanium make particularly attractive jewellery which is both stylish and modern. Width(s) Available: 4mm or 5mm. Precious stone(s) Available: 1 x 8pt white diamond.